As part of SLR's communities initiative, the Sydney and Brisbane Offices have hosted fundraising events this week to support the Cancer Council’s Biggest Morning Tea. 1 in 2 Australians are diagnosed with cancer by age 85 but by donating you are making a real difference helping to fund Cancer Council’s vital research, prevention and support service programmes. The company has long been a supporter of this charity with events held in various offices each year to raise funds for this very important charity. 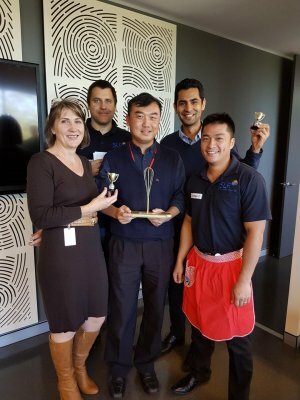 The highlight this year was the Sydney office "bake off" event with trophies awarded for Judge's Choice and People's Choice! Whilst the official Biggest Morning Tea day is not until 25 May, the staff were passionate about commencing fundraising efforts early to ensure our contribution was even larger than the previous year. If you would like to be part of our fundraising efforts you can visit the SLR fundraising page which has been set-up through the Cancer Council.